We are often asked, how do we train Einstein to talk? We did not set out to train Einstein to talk, it just happened. We just talk to him and Einstein instinctively repeats what we say. However, this is not always the case with some parrots. 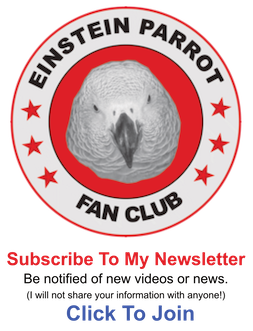 Below is a brief explanation as to why and how parrots talk, followed by the 6 talking tips we use when interacting with Einstein will be explained. All parrots have the ability to talk, but not all parrots talk. It needs to be a parrot species that is naturally vocal. I have know many parrots that choose to be silent. They either find no need to be vocal, or it is believed that the area in the brain that learns speech/communication did not have the proper amount of social stimulation when young. However, just because they don’t vocalize doesn’t mean they don’t understand you! Just as a dog understands, “Wanna go for a walk?” Your parrot understands everything you do and say. They are all incredibly intelligent! Parrots are social creatures. In the wild they learn very quickly to communicate with other parrots in their flock. To find food, to escape danger, etc. When a parrot lives with human companions, they learn to communicate with us. They are so smart they soon learn to identify words with actions or things. It has been our experience that TV, recorded tapes, and radio will not teach your parrot to talk. Parrots need human and social interaction. They also have the anatomy that enables them to mimic sounds and speech in their environment. A short anatomy lesson. Humans use a Larynx, lips, teeth, and a tongue to produce speech. Parrots, use a much different organ called a syrinx. Their tongue and beak play no part in producing sounds. The syrinx is a boney two-part structure located at the lower end of the trachea and is surrounded by air sacs. Air from the air sacs enter the syrinx. The syrinx acts as a resonating chamber which uses highly elastic vibrating membranes to produce sound. In addition, sets of syringeal muscles surround the syrinx and control the movement and the tension of these membranes. To produce sound a bird controls the sound and the loudness by regulating the pressure of the passing air into the syrinx. Concurrently, the bird is varying the tension on the sets of syringeal muscles on the membranes. A crude visual example would be blowing air over and into the top of a soda bottle with a set of complicated membranes and muscles attached. First and foremost, the main requirement you need to teach your parrot to talk is a good relationship. A scared, abused, or frightened bird will be quiet so that it is not noticed. (A life of misery for the parrot.) Or, it may act out in undesirable ways such as biting or screaming. It learned that when it screams, humans will interact with it by shouting back! Even this kind of attention, although not desirable, is better than no attention at all. Parrots want to fit in with the human flock, so allow the parrot time to learn to trust you. Treat your parrot and talk to it like you would a small child. They need nurturing and guidance. Simply talk to your bird as you go through your daily routine. Keep the phrases simple. “Wanna eat dinner?” rather than, “What would you like sweet potatoes and broccoli for dinner?” Other simple phrases we have taught are “Bu-bye!,“ “Hello,“ “I Love You,“ “Wanna Nut,“ here is a complete list of Einstein’s vocabulary. Do not forget to praise! Parrots love to be praised and they love attention! A smile and a “Good Bird” from you is all it takes to teach your parrot that it just did something pleasing. Quickly follow up the praise with a favorite treat and you have reinforced the behavior. Try not to praise unclear words too much, you’ll only want to reinforce the clearly stated words. I cannot stress the importance of Positive Reinforcement Behavior! It is key not only in speech training but also in behavior issues that will surface in the parrots lifetime. I highly recommend the work of Barbara Heidenreich and Good Bird, Inc. Your parrots first attempts at speech may sound like baby babble. That’s OK! Parrots learn to talk just like human children. However, don’t talk "baby talk". Otherwise, you’d have a parrot that babbles like a baby and not clearly understood. Talk to them with clear pronunciation. If you can’t understand what your parrot is trying to say, try to analyze it and think about what you’ve said the past few days. Try to determine what he is saying and reinforce the correct pronunciation. Some words Einstein says didn’t start out perfect. “Squirrel” was “Sqwa” in the beginning, then "Squ-ell”. It was only through reinforcing the proper pronunciation that he learned the correct way to say “Squirrel”. In the wild, parrots display certain behaviors for different reasons. They fluff their feathers, spread their wings, fan their tail feathers, or bob their heads. They do this to get the attention of others in their flock. 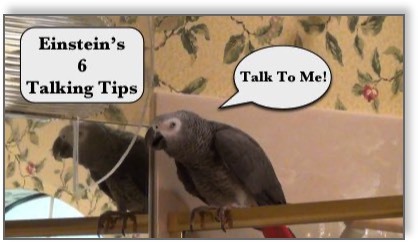 This can work to an advantage in teaching your parrot to talk! When teaching a word, use emphasis and display for your parrot! For example, when teaching Einstein “Who Let the Dogs Out” I sang and danced around like the Baha Men! When teaching chicken and rooster, I strutted around acting like barnyard fowl! Sure, it looked silly, but it worked! Strut Your Stuff! You’re a featherless bird in the eyes of your parrot. You are the only flock member he has. Tell your bird where you are going, or what you are doing. Ask your bird if he wants to “go to the kitchen,“ “go watch TV,“ or “go shower“. Does he like to be scratched? Say a special word just for this activity such as, “wanna scratch?” These are all activities that he may watch you do, so give him words to go with these activities in your daily life. If your parrot is not very verbal, it is still communicating with you through body language. Does your parrot get excited when he sees you eat something? Use this opportunity to introduce a phrase such as “Wanna Eat?”. Give it a taste of what your eating, (providing it is a bird-safe food) or provide a favorite treat reserved just for these occasions. Be consistent, speak clearly, and have fun! This is a technique I learned about when reading about Dr. Irene Pepperburg and her work with Alex, the African grey parrot. For this type of training, you need to have 2 people and the parrot. One person is the trainer, the other is the “rival”. For example, I (the trainer) would ask Jeff (the rival) “What’s a Turkey?” Jeff would reply, “Gobble-gobble!” I would say to Jeff, enthusiastically “Good Boy!” Then, looking at Einstein, “I would say, “What’s a Turkey?” Of course, at the start of training, Einstein wouldn’t know the response, so I would again ask Jeff. Doing a few repetitions, the training session doesn’t have to last more than a few minutes. Then, I would go about my daily chores around the house and occasionally ask Einstein, “What’s a Turkey?” and then go “Gobble-gobble!” (The “Gobble-gobble!” would be much louder and more dramatic than the question. That’s because it is the response I am wanting Einstein to learn.) After a few days, Einstein vocalized a “Gobble” and I was quick to praise him. We would continue with the model-rival training and soon Einstein was answering the question before Jeff could! Does Einstein learn EVERYTHING I try to teach him? NO! There are many things I have tried to teach and have failed! He has yet to learn “Thank-you!” He certainly has a mind of his own and he decides what is worth repeating. I can usually tell if he is interested in the word and worth the time to continue training. “Yabba-dabba-do” is an example. It is also an example of how he progressively learns a word as I described earlier with “Squirrel”. Some things have taken weeks for him to learn. Some words he learns in a matter of days. Others he picks up right away! “Hop-aboard” is one of the words he learned instantly. One evening I was cleaning up the kitchen and he was on the counter. I pushed his perch over to the counter and said, “Hop-aboard! Whoo, whoo!! !” He was saying it perfectly the next morning. If you’ve read this article because you want your parrot to talk, I hope these tips will help in that endeavor. These tips may be also useful in improving your relationship with your parrot. Most folks agree, it is not the talking ability that makes these feathered friends so enduring to us. It is their long-time companionship and personality that connects our hearts to them. Whether your parrot tweets or talks it is the relationship that counts.